It’s interesting how some films are viewed by some people as a great work of art and by others as a piece of trash. For instance, Ernest Scared Stupid comes to mind. I was just kidding. No one would doubt that was Jim Varney’s masterpiece. Anyway, when issues of faith are added to the mix, arguments over the films become even more heated. Some films, such as Martin Scorsese's The Last Temptation of Christ and Monty Python’s Life of Brian, were picketed by Christian groups when they were released -- even though the film’s creators seemed to genuinely believe their films were positive representations of the Christian faith. 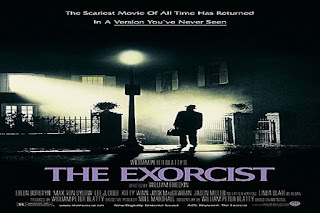 I was a kid when The Exorcist came out in 1973, and there was no way my parents would let me get near the film. But I remember the controversy of the time. People were terrified, and there were rumors of people passing out in theaters, having strokes and heart attacks. The story of priests who battle demons inside a little girl was certainly not anything that was considered proper viewing for people in my church. But my brother was going to Princeton Seminary at the time, and he came back to California to work at Yosemite National Park. He brought with him a friend who was also attending Princeton and who would also be working at Yosemite for the summer. She brought with her a paperback of William Peter Blatty's novel, The Exorcist. (Blatty also wrote the screenplay for the film.) I was surprised to hear her argue that the story was a very Christian one. I believe that the perspective of the film is a Christian perspective. The question for a Christian is whether watching a film with such vile content could ever be worthwhile. Fortunately, we don’t have to deal with such difficult questions here at Movie Churches. 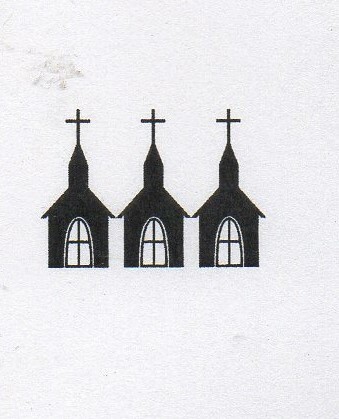 We just look at how clergy and churches are presented in a film and evaluate how many steeples they earn. The Roman Catholic Church in the film is presented as the only Christian organization that believes in demonic possession and exorcism. 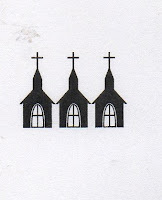 (In fact, many Protestant denominations, especially those of the charismatic and Pentecostal variety, are even more obsessed with such things.) But the Catholic Church is presented as being embarrassed about their own beliefs about demons. Linda Blair plays Regan, the demon possessed girl; Ellen Burstyn plays Chris, Regan’s mother. Chris protests that she has no religious beliefs of her own, but she goes to the church as a last resort to help her daughter. The New Testament has many stories of parents coming to Jesus in desperation to heal their children, and Chris would have fit right in with those stories. There are three priest presented in the film. 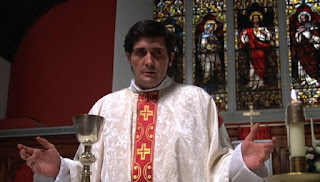 There is Father Dyer (played by William O’Malley) who does not get involved in the exorcism. He seems to prefer going to swanky Georgetown cocktail parties and hanging out with the rich and famous. He says his idea of heaven is a party where he can play the piano and sing standards to the entertainment of the heavenly crowds. Father Dyer does not raise the clergy Steeple Rating in the film very high. Father Merrin (played by Max von Sydow) is an older priest who has battled demons through the years. It has taken a toll on his health, but he continues to fight the good fight. But the story is really about Father Karras (played by Jason Miller). He is a man battling doubt before he ever encounters Regan. He’s not only a priest but also a psychiatrist, and he initially dismisses the idea of demonic possession as misdiagnosed psychiatric problems. His mother’s decline into poverty, illness, and eventually death is bringing him to doubt his faith. We see Karras in various situations, in a subway passing a beggar (“Father, would you help an old altar boy, I’m a Catholic”) and passing by mentally ill women in the asylum where his mother is housed, showing no compassion to those in need. He doesn’t even stop to talk to these hurting people. After encountering Regan, he begins to change. The demons within the girl mock Karras, telling him his mother is in hell and pelting him with obscenity and blasphemy. But with the help of Father Merrin, he continues to fight for the girl, using Catholic rituals and Scripture. The Trinity and the blood of Christ are often cited by the priests as the source of power. Ultimately, Father Karras is willing to give up his own life for Regan’s sake (“Take me!”), a reflection of Christ’s sacrifice. So a worthy finish gives the church and the priests of The Exorcist three out of four steeples.